This 48" Oxford welded grillwork section is hot-dipped galvanized for a durable and rust-free finish. Give your horses and yourself a piece of mind; these Oxford welded grillwork sections are safe and secure! 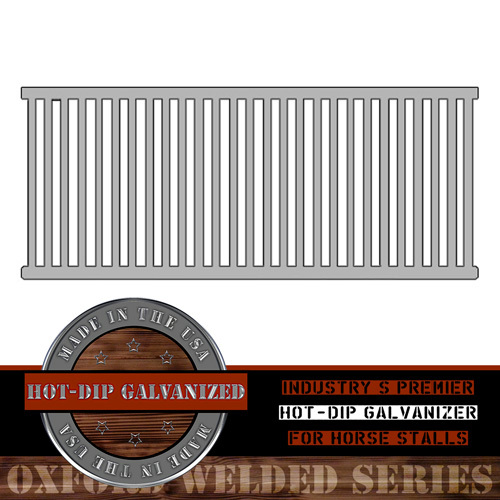 This 65" Oxford welded grillwork section is hot-dipped galvanized for a durable and rust-free finish. Give your horses and yourself a piece of mind; these Oxford welded grillwork sections are safe and secure! This 72" Oxford welded grillwork section is hot-dipped galvanized for a durable and rust-free finish. Give your horses and yourself a piece of mind; these Oxford welded grillwork sections are safe and secure! This 91" Oxford welded grillwork section is hot-dipped galvanized for a durable and rust-free finish. Give your horses and yourself a piece of mind; these Oxford welded grillwork sections are safe and secure! The Oxford welded grill sections are great for both new and existing horse facilities and barns. They can be installed in horse stalls, tack rooms, wash rooms, et cetera and come completely welded together in one piece, so no assembly is required. Installs within seconds; simply screw the grill section where it needs to go and you are done. These Oxford welded horse stall grill sections come with u-channels to completely cover any exposed wood, so horses can't crib. They feature a 3.25" bar spacing on-center, so horses can't get stuck and hurt themselves. They come in both hot-dip galvanized and powder-coated paint.